← Large or Small Handwriting? Yaaaa I can organize both ways :). I guess that’s why I can pin a lot on Pinterest and actually do them too! lol! Great post Mom. You’re a genius and I love ya! Fascinating.thanks so much. Pity handwriting is a dying art. 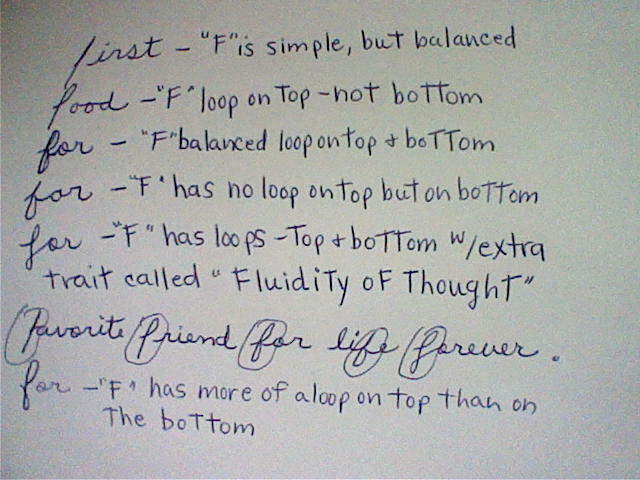 I’m so glad to see your blog again:) A year ago,I used to write f in simple style with no loops on top or bottom.But these days,I’m connecting my f with other letters and I find myself automatically giving loop on upper side.What does it really mean to have imagination on the top?Should I get rid of it? Thanks for reading! It just means you have more imagination in the idea area. You may be thinking of ways ‘to’ organize.